New leaves appear above ground by January in years with adequate moisture. They may grow in this vetegtative state for several years without blooming. PERENNIAL HERB: Generally can only be seen in early to mid spring. 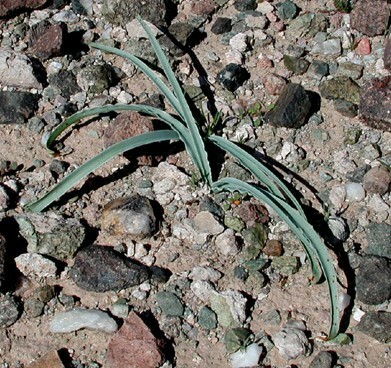 Underground bulb remains dormant through hot and dry seasons, sometimes for years at a time, producing leaves and flowers only when desert rains finally soak the ground bringing favorable conditions. LEAVES: Strap shaped, gray-green leaves are rather fleshy and the margins are wavy. The leaves are clustered at the soil surface. RANGE: Southwestern Arizona, southeast California, northwest Mexico in areas with fairly deep sandy or loamy soil. 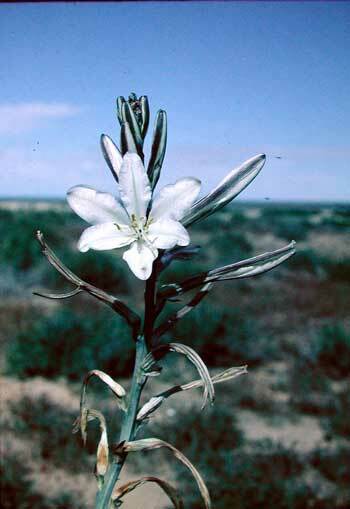 STEMS: The solitary flowering stalk may reach almost a meter tall. FRUIT: Pods with three valve-sections. FLOWERS: Three sepals and three petals alike, appearing as six white perianth segments. Borne on tall spikes with one to three opening each day. See also More Photos by Gena Zolotar.